Complement your outdoor living area with the finest in quality and practicality, with our Echelon 30" Enclosed Drawer. 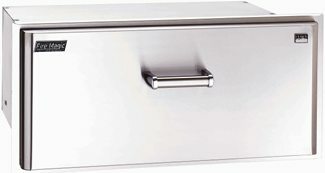 Large enough for all of your BBQ utensils, serving platters, grill gloves etc. A must have for your outdoor cooking experience. Cutout dimensions: 14 1/2"H x 32"W x 20 1/2"D.